For film crews and cast, our high current rental Ground Fault Circuit Interrupters™ provide the ultimate protection of people and equipment working in dangerous environments where electricity must coexist with water. Shock-Block™ ground-fault protection has been recognized for years for its award winning technology. The Rental Shock-Block™ Ground Fault Circuit Interrupter™ was designed for the motion picture, television and film industry. Winner of the 1999 Academy Award® for Scientific and Engineering Achievement, the portable Shock-Block™ is designed to protect actors, film-crew and equipment on sets where water or moisture can create electrical hazards. 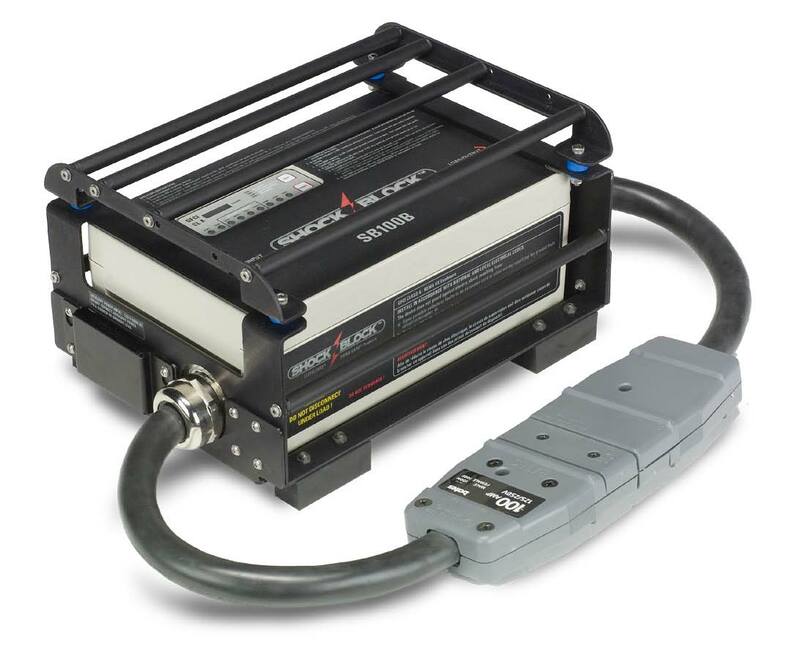 The Rental Shock-Block™ is available for 100 amp applications at 50-132 and 200-240 volts single-phase. The Littelfuse Rental Shock-Block GFCI Lunchbox is also available for power distribution. Designed for outdoor and wet-location filming, the Rental Shock-Block™ line provides in-line, plug-in installation of high current electrical equipment. Featuring 6mA trip level and inverse-definite response time in accordance with UL 943 Class A, these products provide the highest level of protection of people and equipment without costly and nuisance tripping. If you are looking for UL 943C Class C and Class D GFCI protection for your industrial facility, visit our Industrial Shock-Block™ SB6000 series page. SB100 Series 100A GFCI Datasheet.